There is hardly a gardener out there who hasn’t encountered a Japanese beetle. The adult Japanese beetle is a shiny, metallic green with copper-brown wing covers and it’s about 3/8 of an inch in length. However, not all metallic green or copper beetles are Japanese Beetles. To make sure you're dealing with Japanese beetles check their undersides for five small, white tufts under the wing covers and an additional tuft at the end of the abdomen. An individual Japanese beetle doesn’t do that much damage while feeding on a plant, but they tend to congregate in large numbers and can easily defoliate shrubs and trees. These bugs are hard to get rid of, but there are steps you can take to control them. Keep in mind that the adult Japanese beetles are only around for a little over a month, so don’t automatically reach for harsh chemicals unless they become a serious problem. Beetles typically go through 4 stages of development. It’s important to know when they are passing through each stage in your climate because control methods are different for each stage. Egg: Small, oval, white eggs. These are laid in the soil. If moisture is sufficient, they will absorb it and enlarge, becoming rounder as they do. Larvae: This is the white grub stage that is so familiar in lawns. Japanese beetle larvae have a V-shaped series of bristles on their raster (the underside of the tip of the abdomen). Grubs will grow in length as they feed and mature. Pupae: The pupae stage is where the grub starts to transform into a beetle. Japanese beetle pupae start out cream colored and age to a reddish brown. Adult Beetle: The adult beetles are about 3/8 inch long, and the shell is a shiny, metallic green with copper-brown wing covers. Adults emerge from the ground between May and June, depending on your area. They live for about 30 to 50 days. The first beetles to emerge start to look for suitable plants to eat and start feeding immediately. They also send out an odor known as a congregation pheromone to signal later emerging beetles where to go. Mating starts soon after. The females will feed on your plants for a couple of days and then burrow into the soil to lay their eggs. Shortly after, they will return to feeding and mating and start the cycle all over again. By the end of the season, each female Japanese beetle will have laid about 50 eggs. Eggs develop at different rates in different soil temperatures, developing most rapidly in warm soils of about 80 to 90 F. Once they develop into larvae, they will move up toward the surface of the soil and start feeding on roots and organic matter. This is why grub control is usually applied in late summer to fall. The pesticide needs to be applied while the grubs are feeding on the grass roots. As the soil cools and the grubs mature, they start moving back down deeper into the soil for winter. They’ll stay there until the soil warms in the spring, at which time they burrow back up toward the surface where they’ll pupate and eventually emerge as adults. What plants do Japanese beetles eat? There’s a wide smorgasbord of plants for Japanese beetles to feast on, over 300 varieties of trees, shrubs and non-woody plants. Some of their favorites include roses, maples, elms, grapes, and crab apples. They also feed on weeds like poison ivy and bracken. It’s impossible to get rid of Japanese beetles entirely. More will fly in as the current crop are killed. There aren’t many natural controls for adult Japanese beetles. Birds aren’t partial to them, and although some predatory wasps and flies have been imported, their population isn’t large enough yet to control the Japanese beetle problem. The most effective natural control is to go into your garden with a jar of soapy water and knock the beetles into it. Japanese beetles feed in groups, starting at the top of plants, so it’s pretty easy to fill a jar with them. Insecticidal soap will kill adult Japanese beetles only if it is sprayed directly on the beetle. It does not have any residual effect, meaning that beetles that aren’t sprayed directly won’t be harmed. A word of caution about the pheromone beetle traps. They will attract beetles; you’ll probably wind up with more beetles coming into your yard than you would have without the trap. The original intention of the traps was to track when and how many Japanese beetles were in the area, not as a means of eradication. Finally, if you have repeated intense infestations, you should check your soil in late summer to see if you have a large grub population. Lift a 1 square foot section of turf. If there are more than a dozen grubs in this small area, consider treating your lawn with some type of grub control. 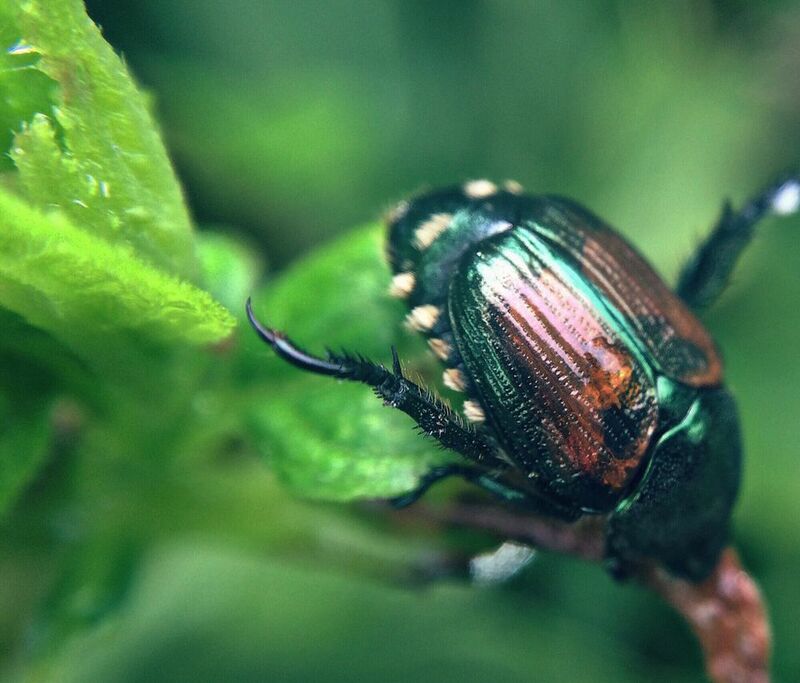 Not every garden that has a Japanese beetle problem is associated with a lawn full of grubs. The beetles can hatch in your neighbor's lawn and find your tasty garden with very little effort. There are several insecticides labeled for use on adult Japanese beetles. These sprays will kill on contact and also have some residual effect. Keep in mind that these sprays will kill more than just the Japanese beetles, so use them only for extreme infestations. Again, Japanese beetles are only a pest for a little over a month, so don’t overreact. Always read and follow label directions when using any pesticide.